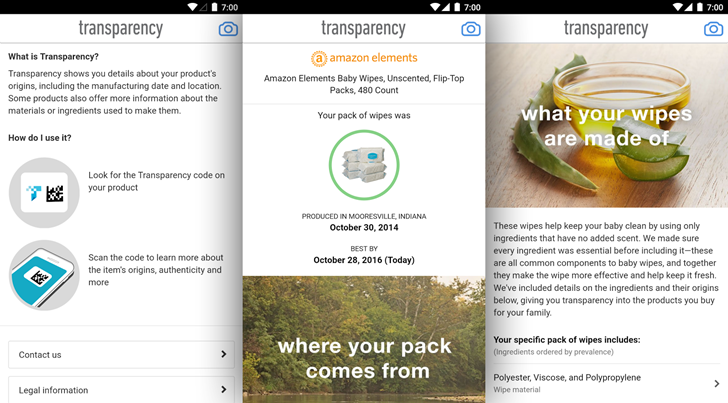 Here's the gist: certain products and packages from Amazon will come emblazoned with the Transparency logo and an accompanying QR code. Scan said code with the Transparency app and you'll be presented with a brief summary of where your item came from and when, including a "Best by" date for perishables. If applicable, it even includes a list of ingredients with explanations for anything not immediately recognizable. While the sentiment is appreciated, it looks like the Transparency program is in its infancy, with Amazon itself being the only verified participating vendor. When presented with an option to show the production history of their wares, presumably with added time and expense included, I can't imagine many of Amazon's retail partners will be keen to jump on board.